Anatomically, a dog's ear has three different sections. Most of the ear, the inner or middle ear remains dark and an owner can’t observe it with the naked eye deep. Along with other microbes, yeast and fungus grow in limited quantity within the ear. Fungus may also occur over other parts of the body, in addition to the ear, but a dogs immune system and skin secretions limit the size of the fungus population. In the ear, dog ear wax limits the size of microbes and fungus colonies. Once the immune system is depressed or if a dog experiences any kind of skin and/or ear problem, canine ear fungus grows into a larger population within days. This causes severe symptoms soon after the growth take hold causing the dog to exhibit clinical manifestations of a typical dog ear infection. If left untreated, canine ear fungus can spread to other parts of the body, especially over the face and paws. Deep in the canine ear, if a yeast infection is not treated properly, infection may spread to the central nervous system and vascular supply. Due to toxicity, death has been attributed to an untreated yeast infection. A canine ear fungus infection of any kind, whether it is bacterial or fungal has common clinical symptoms and a similar pathogenisis (disease development). Symptoms such as pain, oozing yellowish discharges from the ear, swelling, dryness, and redness along with severe itchiness are commonly noted. Clinically, fungal and bacterial infections can be differentiated by signs such as any degradation and swelling at the margins (edges( of the ear flaps. Also, if the dog ear fungus is chronic and been not been attended to for more then a week, symptoms such as swelling and dryness along with itchiness can spread to the face and paws. Severe itchiness leaves a dog with intense discomfort, head shakes and frequent scratching of the ears. 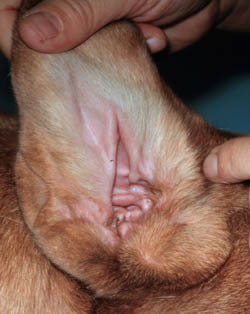 Self injury from dog ear scratching can cause severe lesions and secondary bacterial infections. Canine ear fungus infections are hard to confirm by clinical examination alone, as symptoms of bacterial infections and sometimes those of parasitic infections resemble this condition. To some extent a detailed examination and involvement of the paws in advance conditions can help in making a diagnosis. Laboratory procedures such as culturing of any ear discharge and the isolation of any possible canine ear fungus can confirm the presence of the condition. Confirmatory laboratory diagnosis is usually preferred in advanced and reoccurring conditions. Specifically, dog ear fungus infections are treated with anti fungal drugs. Initially topical ointments and drops are preferred. If the condition persists or becomes generalized (all over the body), then oral administration of formulated anti fungal drugs are used. Anti fungal drugs should only be used with a prescription, as some dogs may be sensitive to them and therefore require dosage adjustments. Along with specific treatment, lesions are usually treated with corticosteroids and anti inflammatory drugs, and applied locally, in the form of creams, ointments or lotions. Medicated and anti fungal shampoos are preferred for bathing an affected dog, at least twice initially and the once a week thereafter until recovery. Regular dog ear cleaning and grooming is another part of therapy, which should be done on regular basis. A dog ear should be cleaned once in a week at home and at least once a quarter by a professional groomer. Dogs with sensitivities and recurring ear problems should be referred to a veterinarian frequently for a detailed examination. In support, to enhance recovery and maintenance of ear health, natural remedies such as Ear Dr. should be used, as these are effective and safe. Natural remedies formulated for maintaining ear health and immune status such as Immunity & Liver Support Formula are also preferred. Have a question about this topic that will help others or want to ask a dog health question? One question each week will be answered by our editors. Ask it here.